Boffa Miskell in conjunction with Aurecon’s transportation team were engaged by Mackenzie District Council to update the town centre concept plan. 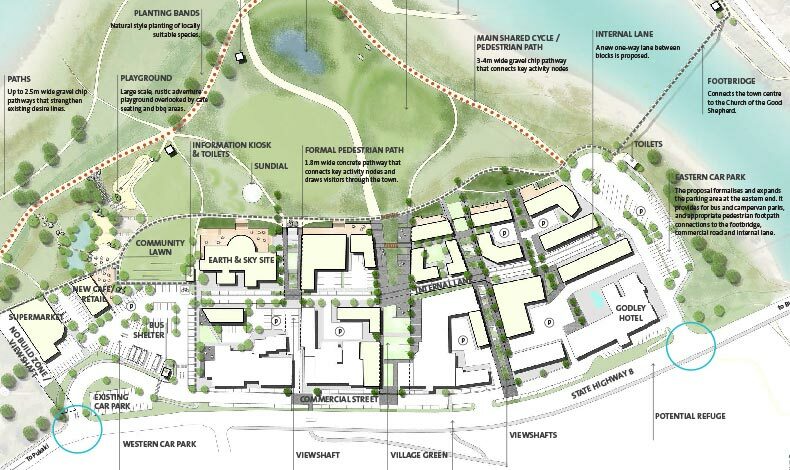 This included refining the vision for the centre; creating an integrated cycle and walking network across the wider lakefront; ensuring there was sufficient car parking to support the growth predicted and to prepare landscape guidance on key public realm elements. The concept plan sets a broad framework for the expansion of the town centre, building on the existing layout and tackling a number of site constraints. The implementation of the concept plan will be undertaken in several stages. Consultation with the community and key stakeholders was held during the course of refining the concept plan. The concept plan aims to cater for new development, achieve a compact walkable centre and build on the high country village theme. The layout includes a series of pedestrian routes connecting different attractions, lake viewshafts, building blocks orientated to take advantage of the views of the lake and the introduction of key open spaces. The landscape concept respects the outstanding natural landscape in which the town sits. The spaces will incorporate a high country landscape palette and include a range of pathways, wayfinding and cultural history references. A key public space is the proposed ‘community lawn’. This will be a place of gathering and adjoins key attractions and a new playground.